I’m naturally a planner. It’s not that I can’t be spontaneous (although, actually, I probably can’t), but I like to be prepared. So if you’re wondering why I’m already concerning myself with what I will eat in January when it’s mid-December, it’s because if there is a situation in life that warrants having a plan, it’s the post-Christmas blues. Of course now it all feels easy. Life is warm and glowy like tacky decorations and fake fireplaces. Christmas, all spiced scents and gifted gold-wrapped chocolate, is fast approaching. Like every year, I attempted to have frugal one. I kept things simple, starting with my family: one present each. Hand cream for mum, a book about some obscure architect for dad. Some “proper” British tea my parents will never drink. A bottle of London gin which will forever age in their pantry. The usual stuff. Then there were Secret Santas, of course: ones at work, ones with friends. And the dinners. So many dinners. Endless dinners. It’s like there is a two week window of time in which I have to sit down and share an overpriced three-course meal with everyone I’ve spoken to this year. Dry turkey, shrivelled pigs in blankets, mince pie ice cream and 13-pound cocktails. Oh, the money I spent on food: buying ingredients for potlucks and nice bottles of wine (well, you know, around the £10 mark) for house parties and Lindor in their shiny red wrappers on the way home. I decided to buy a few decorations, too. A small, awkwardly fluffy Christmas tree, thin golden ribbons and fairy lights, candles that smell of cinnamon and fire. A couple of advent calendars; the chocolate kind and the novelty kind. I went to markets and kept buying more unnecessary presents: local honey and prints from London-based artists and more gin for my parents who’ve never really even tried gin in spite of the fact that I gift them some almost every year. I had to book my flight home. And then the luggage for the flight home. There will be couple of extra items at the airport, of course, because as someone who comes home from a foreign land I can hardly resist the dad-coming-back-from-business-trip-with-presents syndrome. I too try and make up the void of my absence with assorted Fortnum&Mason goods. Sorry I live a thousand miles away, here are some Earl Grey truffles. It’s all ok, though – because it’s Christmas. It’s the time to be extravagant and live like you have the income of the princess of a small European country. January will be cheap anyway, I tell myself. I’ll barely drink, I’ll basically only eat steamed vegetables and will hibernate, thus cutting my social spending. It’s an iron-clad plan. I think I’ll need some good, cheap food. Here are three brilliant, very cheap London restaurants which will see you through at your skintest. Would you like a paneer curry with a side of, err, preaching? Do you prefer it when your food is served in a place where the walls are trying to give you relationship advice? Indian Veg might be perfect for you. But really, it’s probably perfect for you either way. 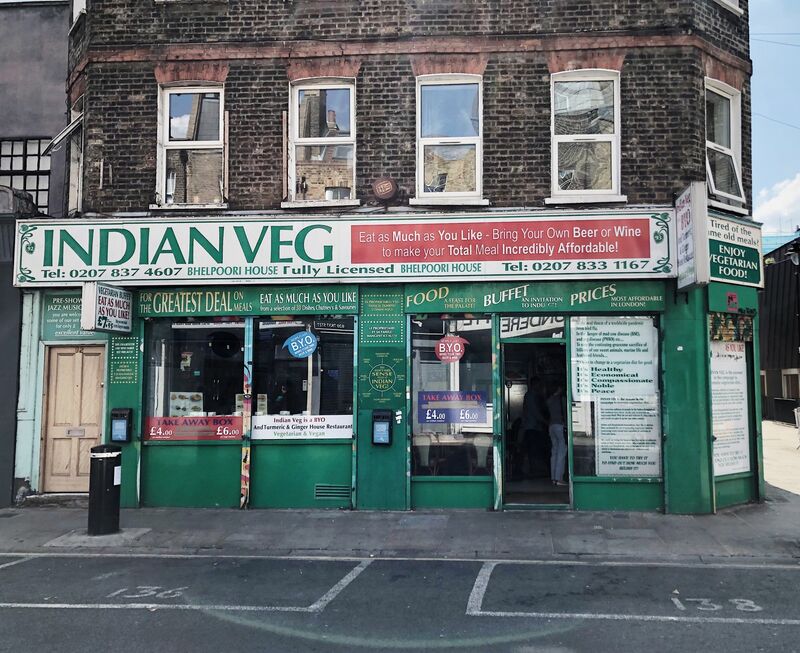 It’s an Indian all-you-can-eat, entirely vegetarian, its walls plastered in posters about the benefits of this and that vegetable, nutritional pyramids with the pictures of meat stricken through from the protein part, lists on how to have a healthy relationship or a healthy life. It’s also quite fun, very decent food, barely £8 and BYOB. There are creamy, lightly-spiced, rich vegetarian curries, freshly fried puris, soupy dhal, bright salads with mango and beetroot, sticky chutneys. You can fill your plate as much as you want, over and over, until you are uncomfortably full. The walls provide the entertainment. So small, you could easily miss it, and what a loss that would be. The surroundings are simple, cafe-like, somewhat utilitarian, and the stews sit behind a counter to be pointed at by the many who come for a takeaway. 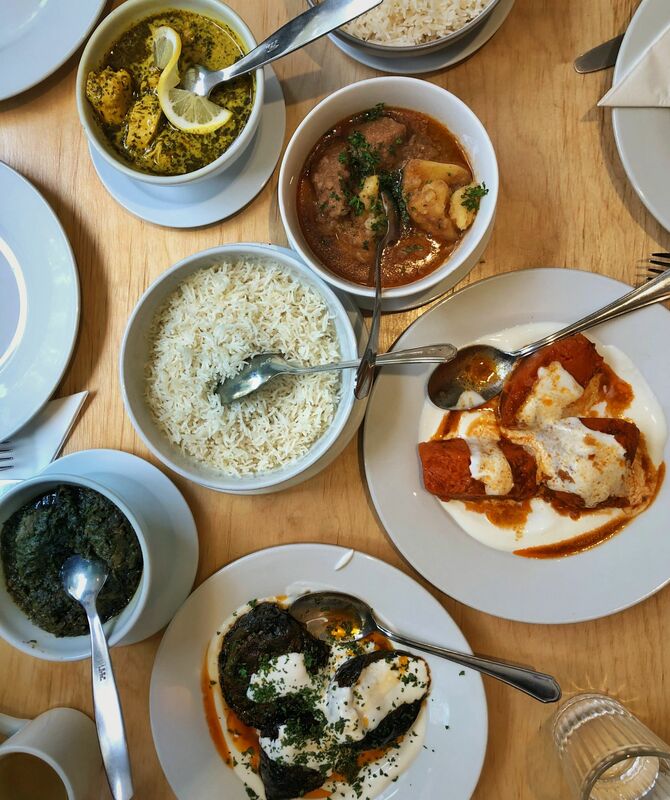 The food is deceivingly simple and hearty: melt-in-your-mouth chunks of lamb cooked in a thick, deep green spinach sauce, or served with boiled potatoes; stewed chicken in a herby yogurt sauce; sweet and smoky aubergine in a pool of runny yogurt and bright red chilli oil, velvety stewed lentils. The mains all come in bowls, to be spooned on basically perfect rice (I could eat bowls and bowls of the stuff), with fiery green chutney on the side. Is this a cop out? Maybe. But when I’m fed up with London, when it feels like this city is charging me for even breathing, when I get tired of clever cuisines and small plates and 8-pound small glasses of red wine, I make my way to Tooting. I do it to remind myself of why I like London. Of the head-spinning variety of food it offers, of the quality and affordability of so many of its meals. 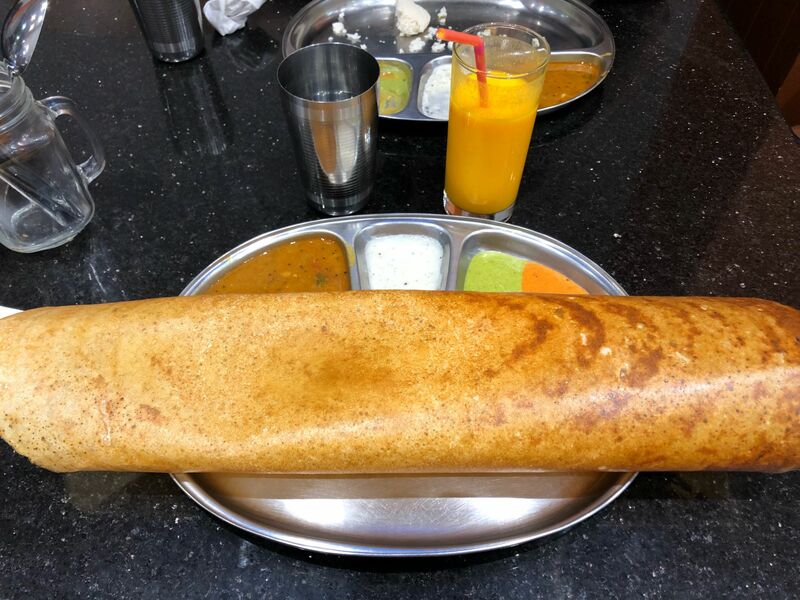 So I go to Dosa’n’Chutny, for lacy, crispy dosas for under a tenner. Or I go to Apollo Banana Leaf, have creamy aubergine curries and huge dishes of devilled mutton, warming and addictively hot. Drown my troubles in an impossibly sweet lassi. Patiently wait for spring to come back.